Lois Bujold is one of my very favourite authors. I adore the Vorkosigan Saga, and feel like I should re-read all her fantasy novels, because I enjoyed them the first time, but need a refresher. Reading another novella set in one of her worlds makes this feeling increase. Sequel to last year’s Penric’s Demon, Penric and the Shaman picks up a few years later, with Penric now a fully fledged divine, scholar and sorcerer, in partnership with his demon, Desdemona. Penric’s present, relatively peaceful existence is interrupted by the arrival of Senior Locator Oswyl, on the trail of a murderer and requiring sorcerous assistance. The two begin the hunt for the apparent perpetrator, Inglis, who has some uncanny issues of his own to deal with, and when the three finally come together, they realise that perhaps things aren’t quite what they might appear. I really enjoyed this new Penric instalment, with a few reservations. I was disappointed with the lack of women in the story – yes, a few appear, but they are peripheral to the story and no matter how awesome, just not terribly important. Even Desdemona and her many personalities didn’t really get much of an outing. And while the multiple point of view narration worked quite well, I thought that maybe three were too many for novella length (and to be honest, I felt them a bit unnecessary – more Penric would have satisfied). Having said that, it was still a very engaging read. I liked the growth of Penric’s character, and his changing maturity was well presented. Another interesting aspect (in both this novella and the other books set in the world) is the exploration of religion that Bujold offers, which is quite different to many I’ve come across. The five different deities and the way they interact with the world are quite fascinating. Terrifying, for some (because a visitation from a god isn’t necessarily reassuring), but fascinating for the reader! In all, thoroughly worth your while as a reader. I think this novella could be read as a standalone (Bujold does an excellent job in most of her books to ensure that) but it certainly rewards the reader invested in the series. 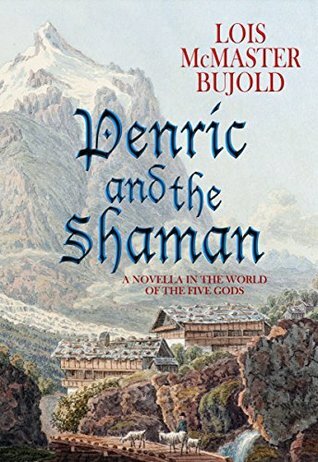 I’m on board for the ongoing Penric journey, and really hope Bujold has more to come! This is one of those books where you get to the end of the story and start grumbling that it’s not a novel. Or for that matter, a series of novels that let you have more of this character, more of this world, more of the twisty ideas threading throughout the piece which tug at ideas that are bigger than the story being told. Our narrator (and she is literally the narrator of the story) is Katya Gould, an Authenticities dealer in a future where everyone is online and retro is big bucks. After making an acquisition, Katya is on her way home from a “shopping trip” when she stumbles across a man doing something he shouldn’t be, shooting protected deer from the forest. 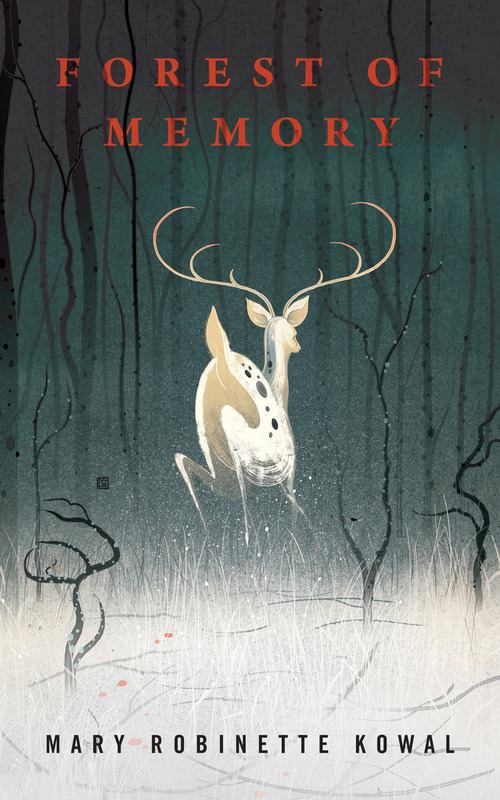 This is the beginning of the somewhat surreal tale Katya tells her mysterious buyer, and throws her into a situation she could never have imagined: offline, out of touch and out of reach, alone in the forest with a strange man who is tagging the deer, and uncertain of her fate. I loved the more abstract elements of this piece the most – it seemed to me that Kowal was unpicking aspects of environmentalism in confrontation with technological reliance, and examining these in a context that was just off-kilter enough to disturb. The discussion of memory, and the way we process life through filters (some of them ours, some of them imposed) was elegant and thoughtful, and cleverly reflected through the deliberate use of typographical errors and cross-outs throughout the text (the conceit being the story is being written on the typewriter Katya acquires at the beginning of the story). Yes, reading a story with errors deliberately left in was a challenge, but the effect becomes powerful as the story unfolds. Forest of Memory is a story that both ends exactly where it needs to but also leaves you yearning for more – it seems there is so much more of Katya’s world to explore and understand, and I would be very happy to hear Kowal intends to do just that. I have been a fan of Gail Carriger’s work since the very first of her Parasol Protectorate series (Soulless) and have read each and every one of her works as they have come out. I backed the audiobook Kickstarter, I’ve read her first forays into self-publishing, and have evangelised her words and worlds to anyone who would listen, hopefully creating a few converts along the way. I’m not quite sure why her work has appealed to me so much, but I daresay it’s a combination of glorious characters (with a particularly female-focus), great steampunk aesthetic, cracking stories and of course, fabulous frocks. I’ve enjoyed every single work I’ve read to date, and Poison or Protect, the first of Carriger’s new self-published Delightfully Deadly standalone novellas, is no exception. Poison or Protect is set between the end of the Finishing School trilogy and the beginning of the Parasol Protectorate books. Our heroine (and she certainly is that – not only is Preshea the protagonist, but this book squarely identifies as a romance, harkening back somewhat to Soulless, where it all began in feel) was a side character in the Finishing School series, and not a very pleasant one at that. Here, Lady Preshea is all grown up, four times a widow and with a reputation for murder, although naturally, it would be gauche to actually discuss such things in polite company. Employed in a dual mission at a country house party, Preshea is thrown into the company of the rather irresistible Captain Gavin Ruthven, who seems both charming and immune to the rumours that surround her. Has Preshea met her match, and can she overcome years of scandal and her deadly training to allow herself chance at something else? This was a absolutely cracker of a story – Preshea, who wasn’t at all endearing in the Finishing School books, is a mature and self-assured character whose unfolding backstory makes her both sympathetic and frightening. Gavin is absolutely adorable and everything a romance hero SHOULD be (rather than what we too often get…) – their sweet and snarky courtship was perfectly done, and a delight to read. I don’t know how much crossover of characters Carriger has planned with this novella series, but I do hope we will get to see this pair again, as well as some of the secondary characters who rounded out the piece in sometimes unexpected ways. In many ways, Poison or Protect is a perfect entry point into Carriger’s world – the reader gets a quick lowdown on the supernatural elements, some nice touches of steampunkishness, and just enough established characters to draw in a new reader, but not too much of anything that a newbie will feel overwhelmed. Rather, they are gently and charmingly introduced, and, naturally, left wanting more. From here, one could happily drop backwards to Finishing School or leap forward to Parasol Protectorate, without spoiling either in any way. Having read all the other books first, I also recommend it as a lovely taster for the seasoned reader – it really is that cleverly done. A highly engaging and vastly entertaining book – can’t wait for the next one!